PC Performance Issues - FileMon to the rescue! 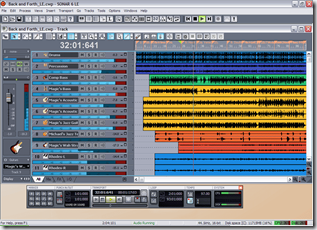 I have a dedicated PC for music recording and production and I recently, out of the blue, started seeing serious performance issues with SONAR LE . Firstly I would like to say that I never install anything on this machine frivolously, in fact the machine is not even connected to the Internet. The only thing that I had changed within the last 3 months was to increase the amount of RAM on the machine from 512MB to 768MB. 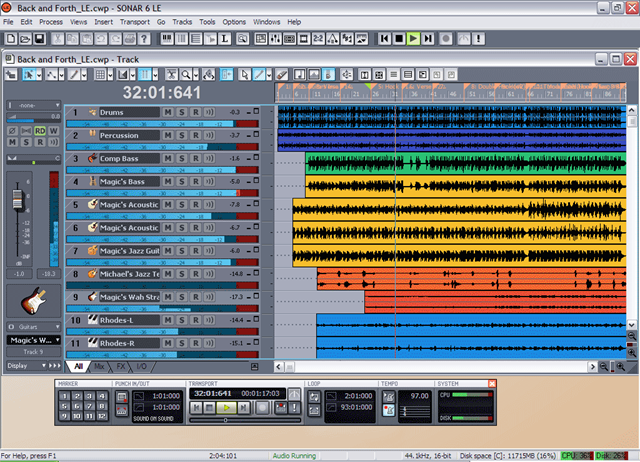 SONAR allows you to record sound and has this fairly standard horizontal graphic layout of the recorded sound. During recording sessions over the last 3 weeks I had noticed that at the conclusion of recording an instrument SONAR would freeze for between 25-35 seconds. During the freeze you would not be able to do anything within SONAR. It would then go back to normal operation at which point I would here a flurry of disk operations. Now the amount of tracks (concurrent recordings) that I had did not seem to affect anything (upper limit is 64 based on the workstation). In fact I was able to replicate this issue with a brand new project. My first assumption was that I was having an issue with the hard drive and I figured I was overdue for a defrag, but after completing the defrag I was still getting the same issue. I am a firm believer in if I did not change anything then nothing should have changed, but I am aware that the Windows operating system is not quite so static. So I ran some internal diagnostics within SONAR LE and still rolled snake eyes. Eventually I came to the conclusion that this issue may be related to the colossal burst of disk activity that proceeded the freeze, my primary assumption being that the wave file that is being recorded was not being handled correctly. So in order to determine what was going on I employed the FileMon tool as developed by Mark Russinovich and Bryce Cogswell. What File Mon revealed was that Sonar was creating the recorded wave correctly and appropriately and in fact closing that file before the freeze, but it also revealed that is was creating and reading files in the folder called C:\Cakewalk Projects\Picture Cach\. Now this folder contained about 10.000 *.wov files dating back to about 2005 which was when I got this machine. 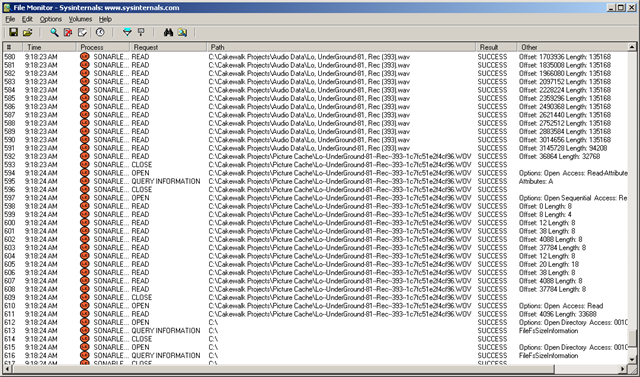 According to Sonar these files are related to the picture representation of wave file and were not related to the function of the music project . I simply could not believe these files were left abandoned for all eternity. 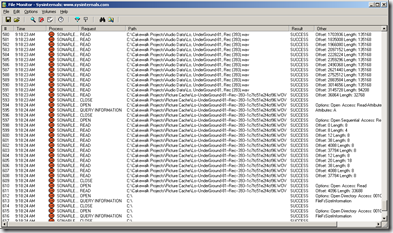 Upon deleting approximately half of these *.wov files I found that the issue of freezing went away. In fact the refresh rate (opening) of all my projects has increased dramatically. I officially dig FileMon! Check it out if you have the time!